Mirror, mirror on the wall, who’s the ‘grammest of them all? Instagram, with its celebration of breathtaking imagery and self-expression, seems custom-made for the beauty world — especially today’s discerning Millennial and Gen Z shoppers. Beauty brands couldn’t agree more. According to this Statista study, 96% of beauty brands are using Instagram. Their reasons for using the platform go beyond form and function. Our Shopper Story report showed that shoppers who use a variety of devices, channels, and platforms are more valuable, spending 22% more online and 3% more offline. 1. Glossier: Make friends with your followers. Glossier’s Instagram is so friendly, you want to reach out and hug it. 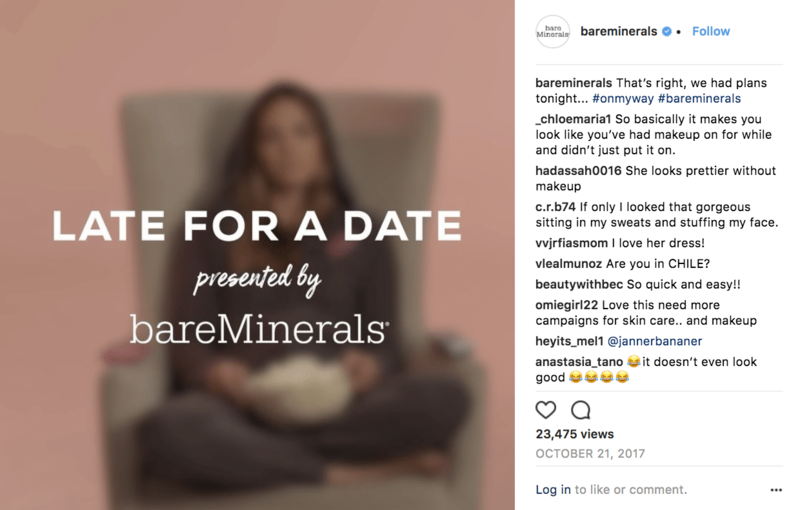 The fanatically followed beauty brand deftly mixes promotional content with just-for-fun posts, while taking special care to engage with followers through plenty of regrams. They creatively reinforce their branding by posting photos featuring their signature pink shade, whether it’s a shot of their packaging, a sunset, or a random pink ceiling. 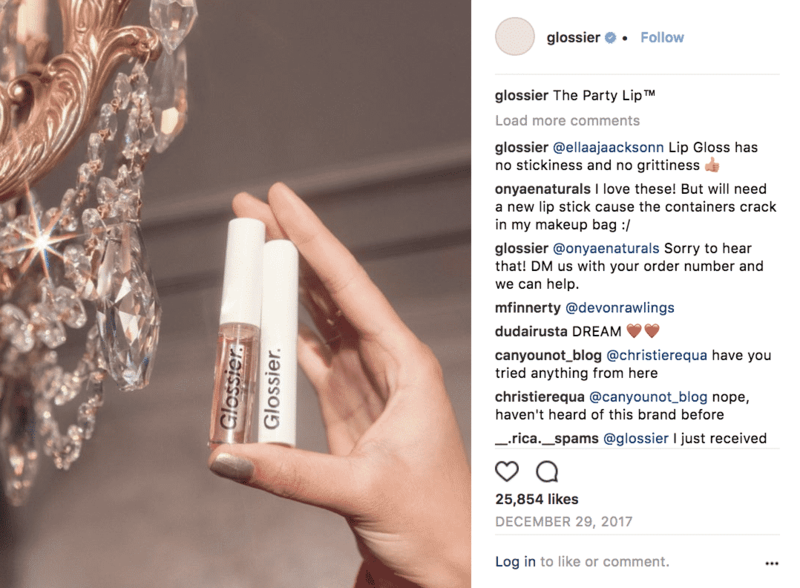 TLDR: Glossier’s feed is as light and bright as their beloved highlighter stick. 2. MAC: Connect with the professional community. MAC is known for its bold, bright looks, and its Instagram doesn’t disappoint. 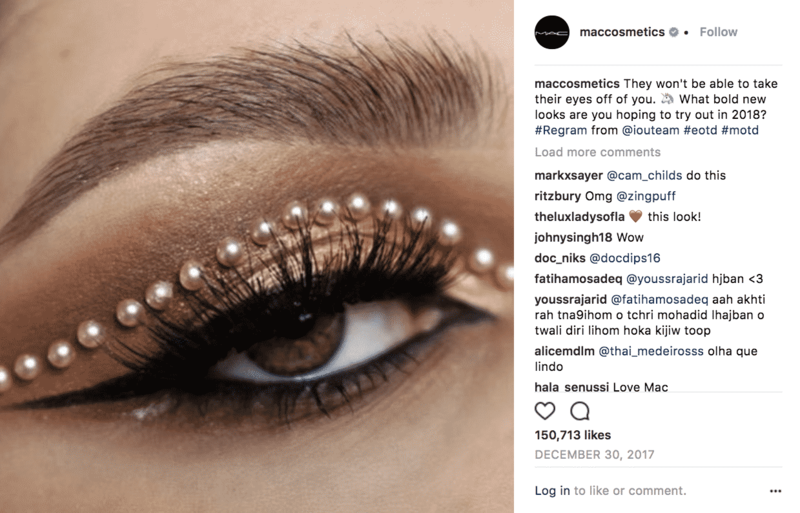 But in addition to the glittery eyes and hyper-pigmented lips, it also celebrates the makeup artist community by regramming MAC artists and promoting hashtags like #MACArtistChallenge and #MyArtistCommunity. Building a loyal fanbase? Check. 3. NYX: Highlight your mission. 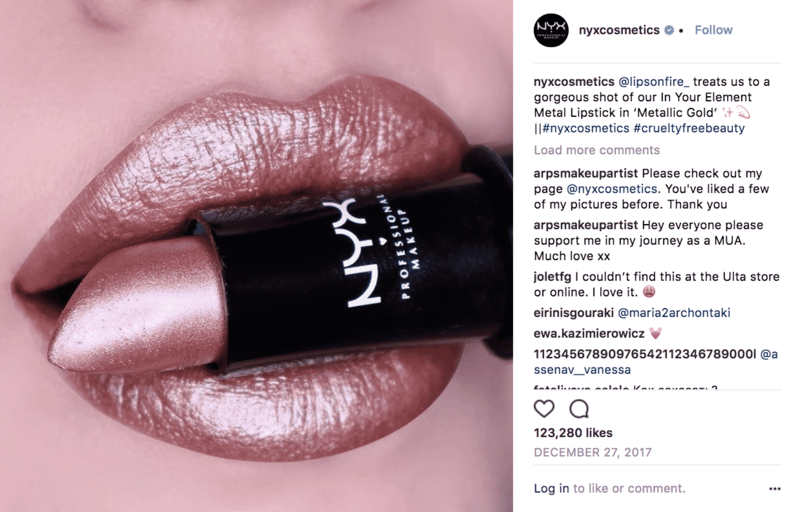 NYX encourages Instagram users to tag #nyxcosmetics to be featured in creative ways, and there’s no shortage of beautiful looks showcasing their products. Bonus points for the fact that their products are all cruelty-free, which they emphasize with the #crueltyfreebeauty hashtag. 4. Urban Decay: Show them how it works. 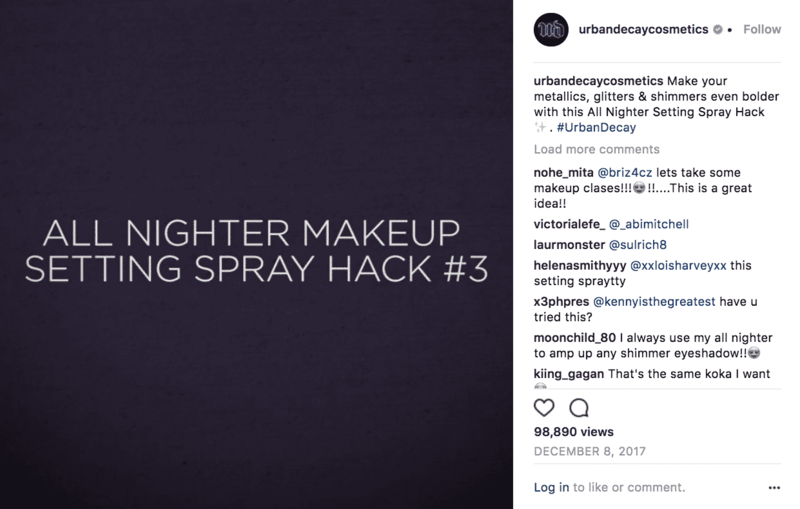 Urban Decay’s Insta amps up the interest with plenty of video, from product ads to makeup hacks and tutorials. It’s one thing to own a product and quite another to use it successfully. UD’s videos help its followers apply their products like a pro. They look good by helping you look good. 5. 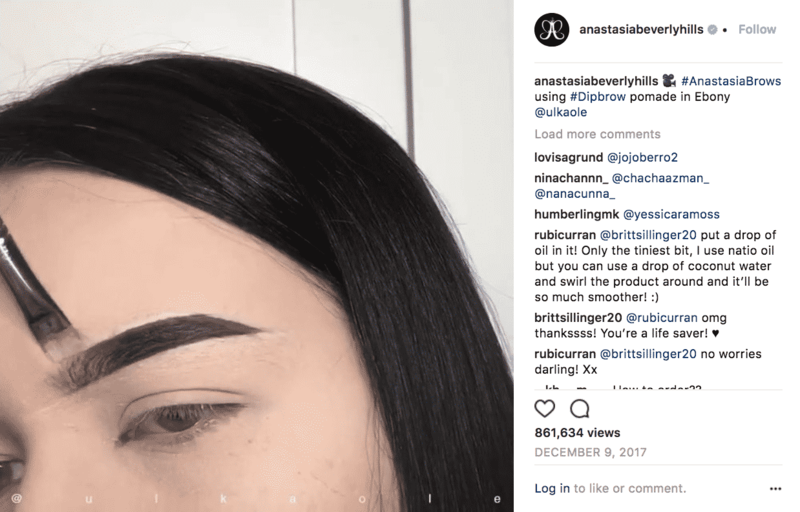 Anastasia Beverly Hills: Let your followers be your brand ambassadors. Today’s look is all about the brows, and Anastasia’s Instagram is full of video tutorials (mostly regrams) for creating perfect arches. It’s a win-win – Anastasia gets to showcase the amazing transformations their products make possible without having to create the tutorials themselves, and followers get specific steps to achieve the looks at home. 6. Too Faced: Build up anticipation and demand. The Too Faced Instagram is a great example of how to roll out a new product. Teaser posts announcing when the new product will be available build interest, and once released, a series of posts with product-specific hashtags highlight each new item. Because each post is different, they’re able to reinforce without fear of message fatigue. For Too Faced devotees, their sneak peeks of products, special offers, and giveaways make it well worth the follow. 7. Benefit: Get them to share. Benefit wins the prize for encouraging the most interaction from their followers. By asking questions and inviting followers to tag friends, they keep fans engaged and expose their brand to new audiences. Savvy cross-promotion with Snapchat also helps build followings on both channels. They’re smart about their regrams too, detailing the specific Benefit products used in each look. 8. Lush: Make it a customer research tool. Lush’s whimsical bath creations are a perfect fit for Instagram. They’re just so much fun to look at, whether on the shelf or dissolving in the tub. 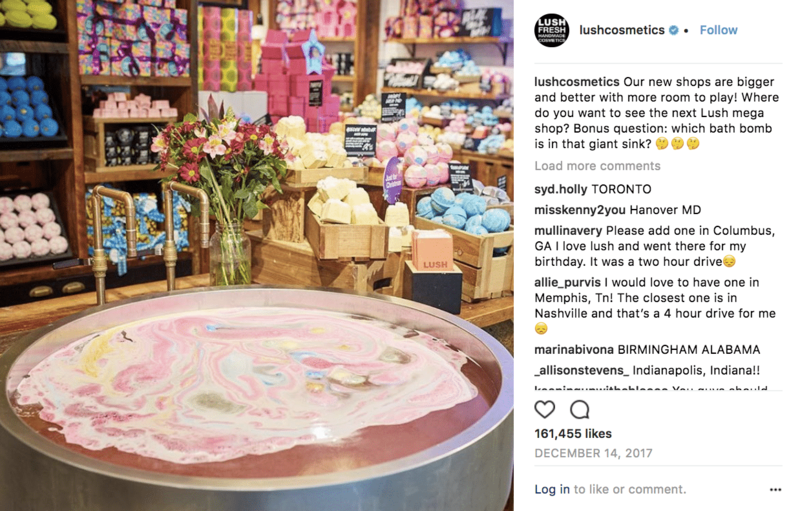 Their feed keeps the fun going, while also gaining valuable customer intelligence, by asking followers questions like, “Bath or shower – which team are you on?” or “what’s your favorite Lush rose product?”. 9. Bare Minerals: Solve a problem for them. We love the Bare Minerals Instagram account for its makeup emergency videos. These little gems show followers how to freshen up their look in 30 seconds or less, for a variety of scenarios, like “Late for a Date”, “Pitch in 10 Minutes”, and “Knock at the Door”. Looking pulled together in under a minute with only 3 products? We’re in. 10. Kat von D Beauty: Use your celebrity status. 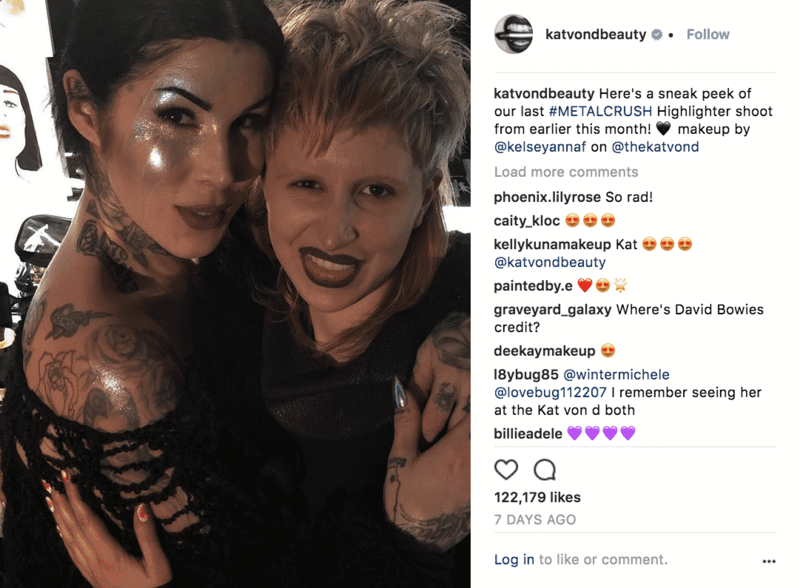 @katvondbeauty is a great example of how to leverage the celebrity behind the brand, incorporating links to Kat Von D’s personal Instagram, and directing followers to their YouTube channel for tutorials and conversations with Kat. If neutrals and girly pinks aren’t your thing, the edgy looks and rock star attitude of this feed are the perfect antidote. 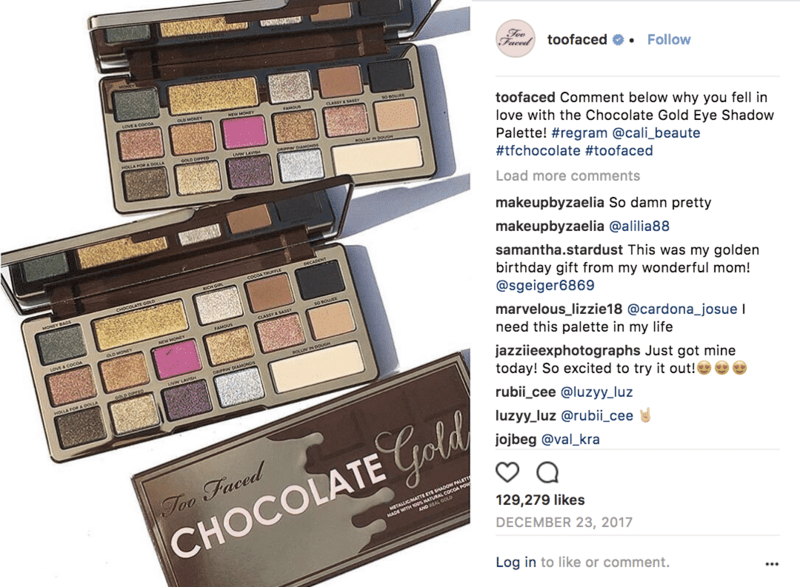 These ten beauty brands are using a variety of tactics to get the most out of their Instagram profiles: regrams, lifestyle content, custom hashtags, video, tutorials, and promotions…to name a few. Their efforts have paid off in the form of millions of followers and potential customers. Another way to tap into the power of this network? Dynamic retargeting ads on Instagram. With about 800 million users (and counting), Instagram is an extremely valuable channel for retargeting campaigns. Re-engage shoppers that are most likely to buy with highly personalized ads and you could see a sales uplift of 12% or better. Here are three of our favorite success stories when it comes to great social retargeting campaigns.